Identification: In general, cichlids (Cichlidae) are superficially similar to sunfishes and black basses (Lepomis and Micropterus; family Centrarchidae). Cichlids can be distinguished from centrarchids by a single nostril opening on each side of the head (vs. two in centrarchids) and the presence of a discontinuous or two-part lateral line (vs. continuous in centrarchids). Distinguishing characteristics, synonyms, photographs, keys, and discussion of hybrids were provided in Trewavas (1983); for identification also see Page and Burr (1991), and Skelton (1993). Illustrations and diagnoses of larval and small juveniles of introduced populations were given by McGowan (1988). Color photographs were presented in Axelrod et al. (1985) and Axelrod (1993). Many or most accounts of "Tilapia nilotica" in U.S. ponds probably refer to O. aureus, likely imported from Israel, before the two species were shown to be distinct (Trewavas 1983). Size: 51 cm (Lee et al. 1980 et seq. Native Range: Tropical and subtropical Africa, and Middle East. Native range includes Senegal, Niger, and many smaller drainages and lakes in Africa and Middle East (Trewavas 1983; Skelton 1993). Table 1. States with nonindigenous occurrences, the earliest and latest observations in each state, and the tally and names of HUCs with observations†. Names and dates are hyperlinked to their relevant specimen records. The list of references for all nonindigenous occurrences of Oreochromis aureus are found here. Means of Introduction: This species has been introduced through a combination of means, including stocking and experimental work by states and private companies (e.g., the electric power industry), and release by individuals seeking to use the species as a sport fish, as forage for warmwater predatory fish, as a food source, and as a means of aquatic plant control. Introductions and spread have resulted by way of escapes or releases from aquaculture facilities and experimental control areas, and from various other holding sites (e.g., zoological parks); through aquarium and bait bucket releases; and by intentional transport by anglers and private individuals (Courtenay and Hensley 1979a; Lee et al. 1980 et seq. ; Courtenay et al. 1984, 1986; Muoneke 1988; Courtenay and Williams 1992). The exact reasons for and sources of some introductions are uncertain (e.g., Texas) (Hubbs et al. 1978; Courtenay and Hensley 1979a). Apparently, power companies became interested in using so-called "tropical fishes" for food or sport in heated effluent ponds used to cool effluents from both fossil fuel fired and nuclear generating plants, where temperatures often became too high to support populations of native fishes (Courtenay and Hensley 1979a). Blue tilapia and redbelly tilapia were inadvertently introduced into Hyco Reservoir in North Carolina in 1984 after a small number of fish escaped from a holding cage located in the heated discharge area during an on-site agricultural study (Crutchfield 1995). Status: Established or possibly established in ten states. Established in parts of Arizona, California, Florida, Nevada, North Carolina, and Texas. Possibly established in Colorado, Idaho, Oklahoma, and Pennsylvania. Reported from Alabama, Georgia, and Kansas. For more than a decade it has been considered the most widespread foreign fish in Florida (Hale et al. 1995). Impact of Introduction: The blue tilapia is considered a competitor with native species for spawning areas, food, and space (Buntz and Manooch 1969; Noble and Germany 1986; Muoneke 1988; Zale and Gregory 1990). Courtenay and Robins (1973) reported that certain streams where this species is abundant have lost most vegetation and nearly all native fishes. It has invaded the Taylor Slough portion of Everglades National Park where it is considered a major management problem for the National Park Service (Courtenay 1989; Courtenay and Williams 1992). The blue tilapia's local abundance and high densities in certain areas have resulted in marked changes in fish community structure (Muoneke 1988, and citations therein). A dramatic reduction in native fishes in the Warm Springs area of Nevada coincided with invasion of this species (Scoppettone et al. 1998, 2005). Blue tilapia have also been implicated as the cause for unionid mussel declines in two Texas water bodies, Tradinghouse Creek and Fairfield reservoirs (Howells 1995). Remarks: Oreochromis aureus has been used widely in aquaculture and is able to live and reproduce in brackish waters. The origin of the U.S. stocks of O. aureus, imported as Tilapia nilotica, was Israel (Courtenay and Hensley 1979a). Voucher specimens taken from the lower Colorado river system, Arizona, in 1980 were initially reported as mango tilapia Tilapia (= Sarotherodon) galilaea; but these were later determined by D. Thys van den Audenaerde to be O. aureus. Some lower Colorado River populations in California and Arizona may be hybrids with O. niloticus (Courtenay et al. 1984, 1986). Although all species from the genus Oreochromis readily hybridize (D'Amato et al. 2007), electrophoretic studies on tilapia sampled from 12 Texas reservoirs indicated that most populations were O. aureus without indicating genetic introgression with other tilapia species (Howells 1991b). There is a 1971 record of Alabama fish overwintering in outdoor ponds at Auburn University (Courtenay and Hensley 1979a, Courtenay et al. 1986); however, tilapia introduced into that state typically begin to die each fall when water temperatures reach about 10°C (Smith-Vaniz 1968). This species was stocked in aquaculture ponds in Iowa to test growth potential; although it reproduced there, it did not overwinter (Pelgren and Carlander 1971; Courtenay and Hensley 1979a). In the southwestern United States, the Central Arizona Project canal system is proving to be a major dispersal route for blue tilapia (Courtenay, personal communication). Collection and reported localities were mapped for all or part of the United States, mainly Florida, by Courtenay et al. (1974), Foote (1977), Courtenay and Hensley (1979a), Lee et al. (1980 et seq. ), Loftus and Kushlan (1987), and Menhinick (1991). Hale et al. (1995) reviewed the history of blue tilapia in Florida. Voucher specimens: Alabama (AUM 20907), Florida (UF 23163, 40306, many others), Kansas (KU 13026, 22917), North Carolina (UNCC uncatalogued), Pennsylvania (PSU 2031). Anonymous. 1992. Two new fish records set. Texas Parks and Wildlife News, January 17, 1992. 7 pp. Axelrod, H. R. 1993. The most complete colored lexicon of cichlids. Tropical Fish Hobbyist Publications, Inc., Neptune City, NJ. Buchanan, T.- Department of Biology, Westark College, Fort Smith, AR. Buntz, J., and C. S. Manooch. 1969. Tilapia aurea (Steindachner), a rapidly spreading exotic in south central Florida. Proceedings of the Southeastern Association of Game and Fish Commissioners 22:495-501. Burgess, G. H., C. R. Gilbert, V. Guillory, and D. C. Taphorn. 1977. Distributional notes on some north Florida freshwater fishes. Florida Scientist 40(1):33-41. Courtenay, W.R., Jr. 1989. Exotic fishes in the National Park system. Pages 237-252 in Thomas, L.K, ed. Proceedings, 1986 Conference on Science in the National Parks: Management of exotic species in natural communities. US National Park Service and George Wright Society. Washington, DC. Courtenay, W. R., Jr., and C. R. Robins. 1973. Exotic aquatic organisms in Florida with emphasis on fishes: a review and recommendations. Transactions of the American Fisheries Society 102:1-12. Courtenay, W. R., Jr., and J. D. Williams. 1992. Dispersal of exotic species from aquaculture sources, with emphasis on freshwater fishes. Pages 49-81 in A. Rosenfield, and R. Mann, editors. Dispersal of living organisms into aquatic ecosystems. Maryland Sea Grant Publication, College Park, MD. Crittenden, E. 1963. Status of Tilapia nilotica Linnaeus in Florida. Proceedings of the Southeastern Association of Game and Fish Commission 16:257-262. Edwards, R. J., and S. Contreras-Balderas. 1991. Historical changes in the ichthyofauna of the lower Rio Grande (Rio Bravo del Norte), Texas and Mexico. Southwestern Naturalist 36(2):201-212. Foote, K. J. 1977. Annual performance report: blue tilapia investigations. Study I: preliminary status investigations of blue tilapia. (Job I-1 through Job I-7; period July 6, 1976-June 30, 1977). Report to the Florida Game and Fresh Water Fish Commission. 71 pp. Gennings, R.M. - Georgia Department of Natural Resources, Atlanta, GA. Response to NBS-G nonindigenous questionaire. Habel, M. L. 1975. Overwintering of the cichlid, Tilapia aurea, produces fourteen tons of harvestable size fish in a south Alabama bass-bluegill public fishing lake. Progressive Fish-Culturist 37:31-32. Hales, L. S., Jr. 1989. 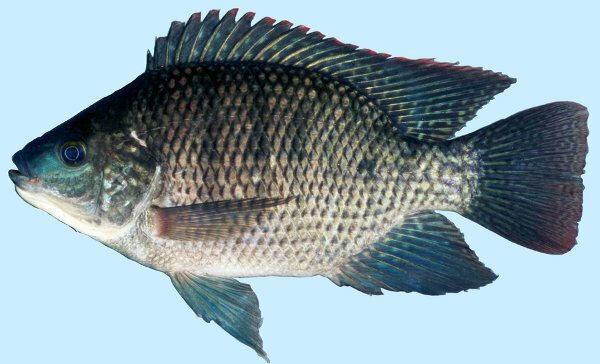 Occurrence of an introduced African cichlid, the blue tilapia, Tilapia aurea (Perciformes: Cichlidae), in a Skidaway River tidal creek. Department of Zoology and Institute of Ecology, University of Georgia, Athens, and Marine Extension Service Aquarium, Georgia Sea Grant College Program, Savanna, GA. Unpublished mimeograph. 12 pp. Herlong, D. - Carolina Power and Light Company. Howells, R. G. 1991b. Electrophoretic identification of feral and domestic tilapia in Texas. Texas Parks and Wildlife Department, Management Data Series 62, Austin, TX. 11 pp. Howells, R. G. 1992b. Guide to identification of harmful and potentially harmful fishes, shellfishes and aquatic plants prohibited in Texas. Texas Parks and Wildlife Department Special Publication, Austin, TX. 182 pp. (+ appendices). Hubbs, C., T. Lucier, G. P. Garrett, R. J. Edwards, S. M. Dean, E. Marsh, and D. Belk. 1978. Survival and abundance of introduced fishes near San Antonio, Texas. Texas Journal of Science 30(4):369-376. Kushlan, J. A. 1986. Exotic fishes of the Everglades: a reconsideration of proven impact. Environmental Conservation 13:67-69. Langford, F. H., F. J. Ware, and R. D. Gasaway. 1978. Status and harvest of introduced Tilapia aurea in Florida lakes. Pages 102-108 in R. O. Smitherman, W. L. Shelton, J. H. Grover, editors. Proceedings of the culture of exotic fishes symposium, fish culture section, American Fisheries Society, Auburn, AL. Loftus, W. F., and J. A. Kushlan. 1987. Freshwater fishes of southern Florida. Bulletin of the Florida State Museum of Biological Science 31(4):255. McGowan, E. G. 1988. An illustrated guide to larval fishes from three North Carolina piedmont impoundments. Report by Carolina Power and Light Company, Shearon Harris Energy and Environmental Center, New Hill, NC. 113 pp. Moore, V. - Idaho Fish & Game, Boise, ID. Muoneke, M. I. 1988. Tilapia in Texas waters. Texas Parks and Wildlife Department, Inland Fisheries Data Series 9, Austin, TX. 44 pp. Noble, R. L., and R. D. Germany. 1986. Changes in fish populations of Trinidad Lake, Texas, in response to abundance of blue tilapia. Pages 455-461 in R. H. Stroud, editor. Fish culture in fisheries management. American Fisheries Society, Bethesda, MD. Pelgren, D. W., and K. D. Carlander. 1971. Growth and reproduction of yearling Tilapia aurea in Iowa ponds. Proceedings of the Iowa Academy of Science 78:27-29. Pigg, J. 1978. The tilapia Sarotherodon aurea (Steindachner) in the North Canadian River in central Oklahoma. Proceedings of the Oklahoma Academy of Science 58:111-112. Rogers, W. A. 1961. Second progress report on stocking and harvesting of tilapia and channel catfish in Alabama's state-owned and managed public fishing lakes. Federal Aid Project F-10. Alabama Department of Conservation. 10 pp. Skelton, P. H. 1993. A complete guide to the freshwater fishes of southern Africa. Southern Book Publishers, Halfway House, South Africa. Skinner, W. F. 1984. Oreochromis aureus (Steindachner; Cichlidae), an exotic fish species, accidentally introduced to the lower Susquehanna River, Pennsylvania. Proceedings of the Pennsylvania Academy of Science 58:99-100. Skinner, W. F. 1986. Susquehanna River tilapia. Fisheries 11(4):56-57. Skinner, W. F. 1987. Report on the eradication of tilapia from the vicinity of the Brunner Island Steam Electric Station. Pennsylvania Power and Light Company, Allentown, PA. Unpublished mimeograph. 18 pp. Smith-Vaniz, W. - Ichthyologist, National Biological Service, Gainesville, FL. Smith-Vaniz, W. F. 1968. Freshwater fishes of Alabama. Auburn University Agricultural Experiment Station, Auburn, AL. 211 pp. Smith-Vaniz, W. F., J. D. Williams, L. G. Nico, and W. Loftus. Key to the cichlid fishes of Florida. Unpublished mimeograph (in prep). Stauffer, J. R., Jr., S. E. Boltz, and J. M. Boltz. 1988. Cold shock susceptibility of blue tilapia from the Susquehanna River, Pennsylvania. North American Journal of Fisheries Management 8:329-332. U.S. Fish and Wildlife Service (USFWS). 2002. USFWS memorandum on Tilapia Removal Program on the Virgin River, Clark County, Nevada and Mohave County, Arizona. http:// http://www.fws.gov/southwest/es/arizona/Documents/Biol_Opin/02299_Tilapia_Removal_Virgin_River.pdf. Accessed on 4 October 2007. Zale, A.V. - Oklahoma State University (formerly); National Biological Service, Bozeman, MT (currently). Zale, A. V. 1987. Periodicity of habitation of a stenothermal spring run in north-central Florida by blue tilapia. North American Journal of Fisheries Management 7:575-579. Zale, A. V., and R. W. Gregory. 1990. Food selection by early life stages of blue tilapia, Oreochromis aureus, in Lake George, Florida: overlap with sympatric shad larvae. Florida Scientist 53:123-129.